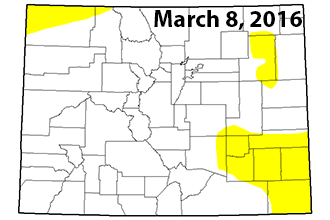 By the end of February, only a small portion of western Kiowa County was considered abnormally dry. 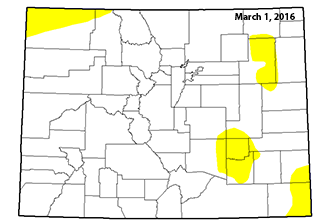 March has started with above seasonal temperatures and little or no precipitation over the southeast plains of Colorado. Although March tends to be one of the wettest months, this year's start has lead to much of southeast returning to abnormally dry conditions. That may change as the month progresses. While there is a slight chance of thunderstorms Saturday evening, the climate outlook through the end of the month and beyond gives some reason to be hopeful. The March precipitation outlook shows a 50 percent chance of above average precipitation in the area. The three-month outlook is even more hopeful, with a 40-50 percent chance of above normal precipitation across all of Colorado. During the same period, the temperature outlook calls for normal to below normal temperatures.